I recently posted a poll on social media asking for recipe suggestions and I received a couple of requests for Madeleines. It's been a while since I've made them, so I had to spend some time working out this recipe - like two months. But, I am finally happy with the end result. Batch after batch, there was always something wrong with the finished product. My focus was always achieving the signature hump. In the pastry world, the bigger the hump, the better the pastry chef. Traditionally, the cookie should be served decorative-side down, allowing the hump to shine. So, in true Anthony fashion, I was starting to drive myself crazy, worrying more about the hump than I was the flavor and texture. When I first made this version of the recipe, I was going to toss them before even tasting them because the (lack of a) hump was depressing. But, they baked perfectly - an even golden rim on the border of the cookies. When I went to un-mold them they were almost weightless, the perfect sponge. At this point I knew I should at least taste them. They were DELICIOUS. Now the dilemma - do I keep tweaking to achieve a hump when everything else is perfect or call it a day? Eff the hump. Some ingredient notes: I've added vanilla bean in this recipe, which I think pairs nicely with the citrus. I used a tangelo (a cross between a tangerine and grapefruit,) but a plain old naval orange will work, too. The golden syrup adds to the necessary sweetness and offers a hint of earthiness which highlights the vanilla, but if you can't find it, honey will work. In a bowl combine the flour, baking powder and salt; whisk well. In another bowl, combine the sugar, zest and vanilla. Massage the sugar with your hands to release the oils of the tangelo. Place the eggs into the bowl of a stand mixer and, with the whisk attachment, scramble. Add the sugar mixture and golden syrup and whisk, on high, until the eggs thicken and lighten in color, about 3 minutes. Gently fold the flour mixture into the egg mixture. Add the melted butter and whisk, just to combine. Transfer the batter to a piping bag, seal and refrigerate at least 4 hours, but preferably overnight. When ready to bake the Madeleines, preheat the oven to 400 degrees. Generously spray a Madeleine mold with non-stick cooking spray. Place the mold in the freezer for 10 minutes, or until the spray is frozen. Pipe the batter into the cavities, filling each no more than 3/4 of the way full, about a heaping tablespoon. Bake for 8 until the tops are set, and the edges of the cookie are golden. Cool for a few minutes before using an offset to carefully remove the madeleines from the molds. Serve warm or room temperature with a sprinkling of confectioners sugar. 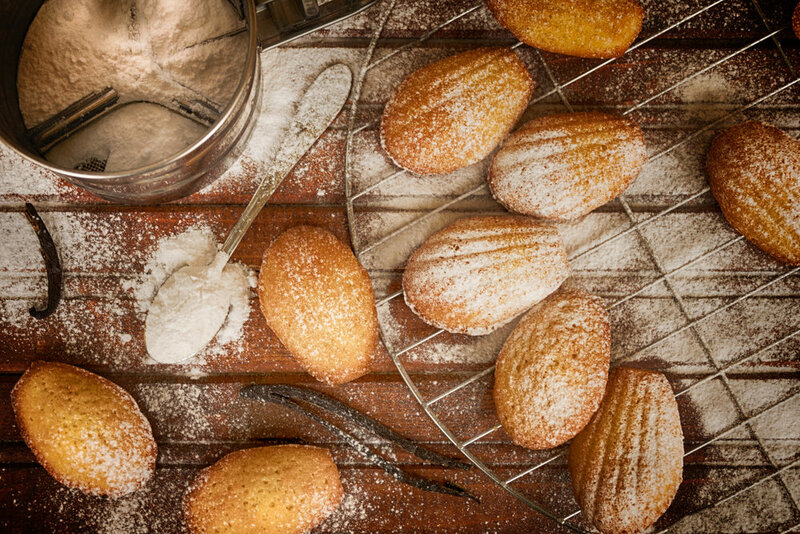 NOTES: Madeleines taste best the day that they're made. Finally, you're better off under-filling the molds; a little batter goes a long way.